Pray the Rosary, don’t just say it. Think of the Mysteries in your mind to meditate. Feel the Mysteries in your heart to contemplate. Bless yourself with the cross and say the Apostles Creed. Move to the first large bead and say the Our Father. 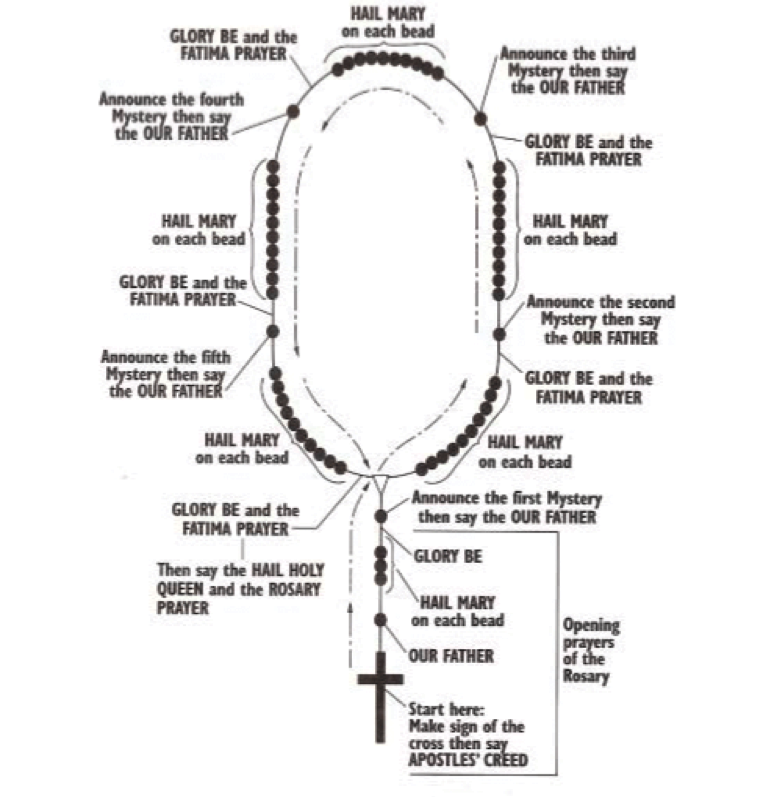 On each of the three following beads say the Hail Mary. On the final introductory bead say the Glory Be. Start the first decade (decade = a group of ten, referring to 10 Hail Marys) by meditating on the first Mystery. On the starting medal say the Our Father. On each of the ten following beads say the Hail Mary. On the chain before the singular bead say the Glory Be. Then add the Fatima Prayer. Say the rest of the five Decades, each time meditating on one of the Mysteries and following as with the first Mystery, the Our Father on the singular bead, then ten Hail Marys, etc. At the end (optionally five decades or the full 20 decade Rosary), recite the Hail, Holy Queen and, optionally, the St. Michael Prayer and the Memorare. Plenary: Once a day when recited in a church or public oratory; also when said in a family, religious community or pious association, on the usual conditions of Confession (one week before or one week after), Communion, and prayer (the same day) for the intention of the Holy Father. Partial: Several times a day, when said in circumstances different from the aforesaid. I believe in God, the Father Almighty, Creator of heaven and earth, and in Jesus Christ, His only Son, Our Lord, who was conceived by the Holy Spirit, born of the Virgin Mary, suffered under Pontius Pilate, was crucified, died, and was buried. He descended into hell. The third day He arose again from the dead. He ascended into heaven and sits at the right hand of God, the Father Almighty; from thence He shall come to judge the living and the dead. I believe in the Holy Spirit, the holy Catholic Church, the communion of saints, the forgiveness of sins, the resurrection of the body, and life everlasting. Amen. Hail Mary, full of grace! The Lord is with thee. Blessed art thou among women, and blessed is the fruit of thy womb, Jesus. Holy Mary, Mother of God, pray for us sinners now and at the hour of our death. Amen. (at the end of each decade, after the Glory Be). O, my Jesus, forgive us our sins, save us from the fires of hell, lead all souls to heaven, especially those most in need of Your mercy. (after the last Glory Be). Hail, holy Queen, Mother of Mercy, our life, our sweetness and our hope! To thee do we cry, poor banished children of Eve. To thee do we send up our sighs, mourning and weeping in this valley of tears! Turn then, most gracious advocate, thine eyes of mercy toward us, and after this, our exile, show unto us the blessed fruit of thy womb, Jesus. O clement, O loving, O sweet Virgin Mary! O God, whose only begotten Son, by His life, death, and resurrection, has purchased for us the rewards of eternal salvation, grant, we beseech Thee, that meditating upon these mysteries of the most holy Rosary of the Blessed Virgin Mary we may imitate what they contain and obtain what they promise, through the same Christ our Lord. Amen. Prayer to St. Michael. St. Michael, the archangel, defend us in battle. Be our protection against the wickedness and snares of the devil. May God rebuke him, we humbly pray, and do thou, O Prince of the heavenly host, by the power of God, cast into hell Satan and all the evil spirits who prowl about the world seeking the ruin of souls. Amen. The Memorare. Remember, O most gracious Virgin Mary, that never was it known that anyone who fled to thy protection, implored thy help or sought thy intercession was left unaided. Inspired by this confidence, I fly unto thee, O virgin of virgins, my mother, to thee do I come, before thee I stand, sinful and sorrowful. O Mother of the Word Incarnate, despise not my petitions, but in thy mercy hear and answer me. Amen.